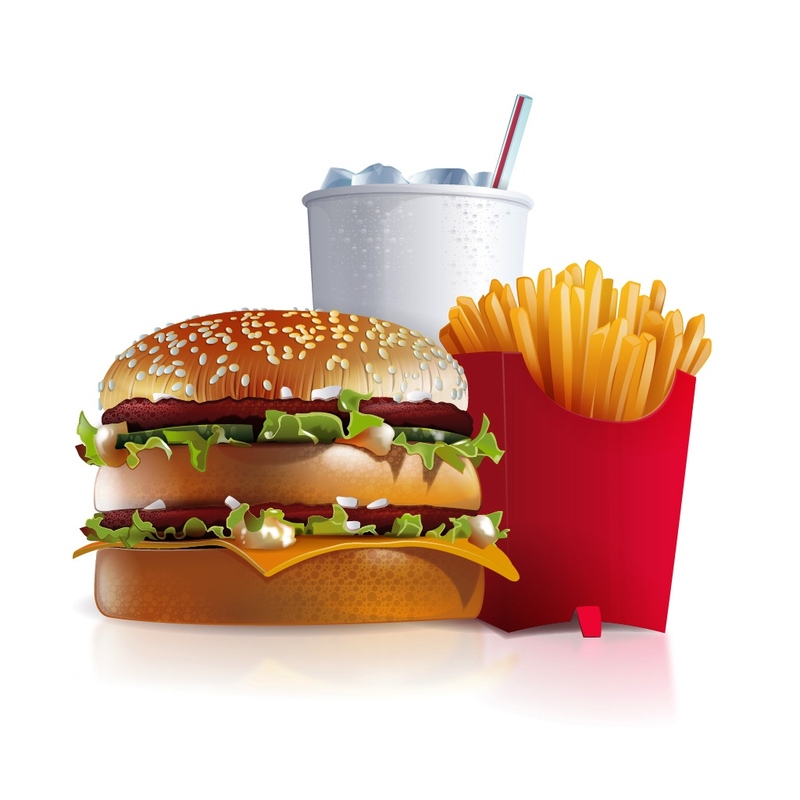 Fast Food Frenzy is guaranteed to be a blast for your group. There are several versions in which you can play, which we will outline below. The Word Doc allows you to customize the Fast Food locations with their slogans, or you use the PDF and simply print and play. We have placed a tie breaker on the game sheet, but should two people get it correct, the person who turns it in first is the winner. Simply mark the sheets with a number at the top as they are received, then simply look for the lowest number to identify your winner. Same as above, only group them into teams of 3-5. You can also add more fast food locations and slogans, using more obscure places. Print the names (or pics of) the fast food restaurant on 10 sheets of paper (1 restaurant per sheet) along with the slogans on 10 separate pieces of paper. If you have room, tape the restaurants to the wall and have them match the slogans by taping them underneath the corresponding restaurant. Each person on the team will be handed a slogan and the team must line up single-file. When the game starts, one person will go at a time until all ten are placed. You will then have a leader (with an answer sheet) tell them how many they have correct. If they do not have all ten, the next person in line can make one switch, followed by another who can do the same and so on, until all ten are correct. 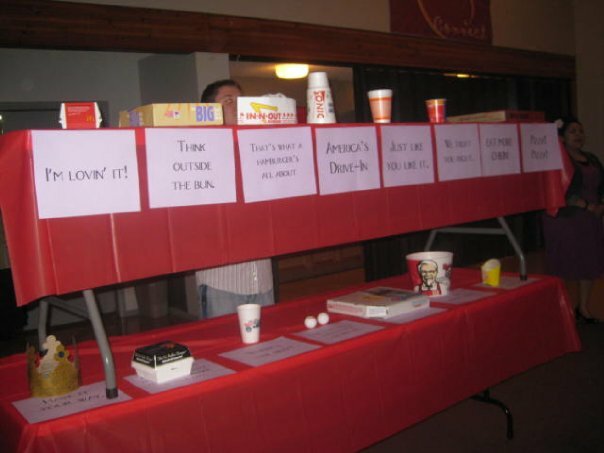 A few years ago, we played Ultimate Fast Food Frenzy and had an incredible time! You can see the picture below to help understand what we are going to explain. For this game, we went out to different fast food restaurants in our area and simply asked for empty food containers or item associated with the restaurant. Almost every store obliged and it was also a great conversation starter. We then set up two tables with table clothes and carefully stacked them on each other. For our game, we had six teams, which meant twelve tables (and six of each item) set up across the room. We set them up before the evening began so we didn’t have absolute chaos. Once teams were situated, we had them form a single file line, with papers face down on the ground. The back of each paper had tape on it so that the slogan would adhere to the table cloth. We did relay format, so once the first person matched the slogan to the item, the next would follow suit. At the end, we had a 15th person (this is optional), who was allowed to act on behalf of the group to move any incorrect slogans to the appropriate place. 1. Play fun music in the background as groups are guessing. 2. If there was ever a game that called for a gift card(s), this is it. You could also give away a kids meal(s) or toy(s) from one of the restaurants. 3. Post a picture of the winner(s) and engage social media by posting some of the more difficult slogans and asking for people to take a shot at guessing the restaurant.